The Alchemist has long been a well-known name on the cocktail scene in the North. With the original bars based in Manchester and a further site in Leeds, Northerners are well-versed in the theatrical, dry ice fuelled menu that has now come to London. The first London opening (we say first, because we have it on good authority that there will be up to four more opening this year across the city) is in the centre of The City, on Bevis Marks, in the shadow of the Gherkin and Heron Tower. Like its northern counterparts, this bar and restaurant is a glint of indulgence amidst a sea of black suits. At the heart of The Alchemist is their fun and experimental ‘molecular' mixology - think smoking tea cups, secret ingredients and dry ice. It's a little bit Alice in Wonderland meets The Office. However, if that's not your thing, the large restaurant serves an extensive menu of all-day eats, from your classic eggs benedict to club sandwiches and fajitas. It's not exactly gourmet, but there's something for everyone, which kind of works for a business meeting spot. 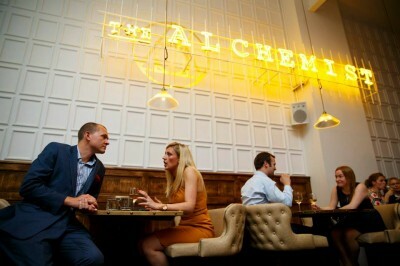 For opening times and a chance to look through the extensive cocktail and food menus, visit www.thealchemist.uk.com.